We are going to touch on sharps, flats, and naturals. This will only be an explanation of what they are and not a complete explanation of how they are used. We will discuss them in fuller detail in a later lesson. Here is an example of these on a musical staff. Most of the letters that make up the musical scale (A, B, C, D, E, F, & G) can have a sharp or a flat, however not all of them can. If you have ever seen a piano (of course you have), the black keys are sharps or flats. A, A#, B, C, C#, D, D#, E, F, F#, G, G#, and then it all repeats. G, Gb, F, E, Eb, D, Db, C, B, Bb, A, Ab, and then it all repeats. Notice that between B and C, and between E and F, that there is never a sharp or flat. This is a constant in music. I will speak more on this in a minute. A double sharp raises the note a whole step and a double flat lowers the note a whole step. A regular sharp only raises the note a half step and a flat only lowers the note a half step. Does anyone know what a step is in music? As you would expect, it is a movement (whether forward or backwards). Actually, let me first explain what a Half-step is. 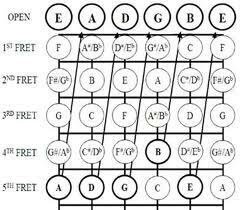 A half-step is one fret on the guitar (or bass), or it is one key on the piano (or keyboard). It is the next note forward or backward. Let’s look at some examples so that it becomes crystal clear. 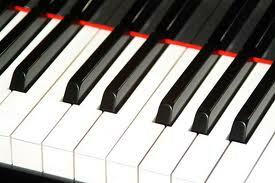 A half step on a piano is from one key to the next or on a guitar from one fret to another. A whole step is two half steps (two keys on a piano or two frets on a guitar). With that information, look at the piano keys above. There is a whole step from each lettered note except “B” and “E”. “B” and “E” have no sharps. It is only a half step from “E” to “F” and from “B” to “C”. 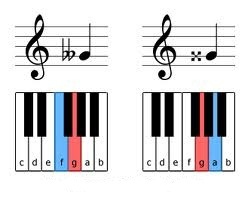 I still want to touch on this subject, but you won’t know the whole picture till you understand Key Signatures, but this will help you to know what they are. Accidentals are exceptions to the rule. In music theory, there are set rules as to what can and cannot happen. But, you can go outside of theory. When you do that, you will end up with an accidental (and perhaps a natural). Let’s say a key signature has one flat (a “Bb”). But you want to play a lead that has an “Eb” in it. Well, you would write it that way and the note would be called an accidental because it went outside of the Key Signature. 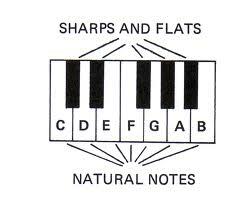 A Natural is similar to an Accidental because it goes outside of the Key Signature. Let’s say you are playing a piece of music that has one sharp in it (an “F#”). During that lead, you want to play an “F” note. When you write it, the Key Signature is determined at the beginning of the song, so when you write the note, you have to put a Natural sign before it to show that it isn’t an “F#”, it’s an “F”. A Natural sign erases sharps or flats that have been previously established. To see a Natural, look at the example at the beginning of this Lesson. This concludes Lesson 6. I hope you found it to be informative. You should review it and know it. Then go on to Lesson 7. I hope that you understand everything alright. If you have any questions, feel free to ask and I will try to explain it better.